Post feature Report RSS	What Is… Attack Ship? Read our newest blog post introducing Attack Ship - the steerable vessel that can shoot at enemy planets. It’s tricky to master, but the fun of pricking your opponents with close blasts is totally worth it. Guns and lasers are fun, but what about spaceships? One of the most frequent suggestions for Interplanetary (our previous game) was adding spaceships. The moment words “space” and “sci-fi” meet in the same sentence, someone is bound to mention spaceships. Nevertheless, we decided to steer clear from the beloved sci-fi cliché, and focused on the planet-to-planet artillery combat instead. But that was Interplanetary… With Worbital, things are different. We wanted more fun and chaos, and so we thought the time has come to release the Kraken. I mean, Attack Ship. A steerable weapon, Attack Ship was the first of its kind to be developed for Worbital. It was inspired by the ships from a legendary mid-90s Finnish freeware game, Wings. Essentially, Attack Ship is a spaceship on a suicide mission. Launched from the deck on the planet surface it goes off into space and can be navigated by WASD-keys (or D-pad on controllers). The ship itself can fire small shots at the target ahead, so the trick is to get your ship just in the right position. You have to constantly balance your ship’s thrust and rotation to withstand planets’ gravitational pull. Sometimes the masterful steering can give you a chance at multiple nice shots close up. But if you’re not versed in the navigation, the mission might end before it even begins… Hey, who said the ship itself can’t be a projectile? (see the GIF below) Fortunately, no living beings are on board, or so I’ve been told. 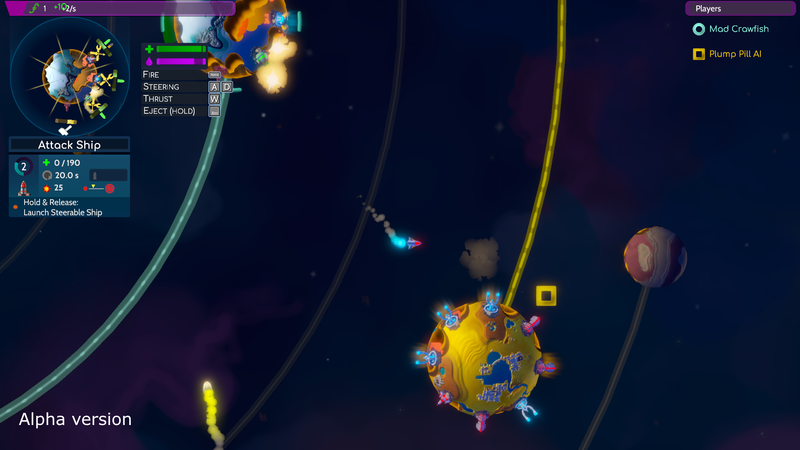 With time, we added more steerable weapons, just because the mechanic seemed like fun. Now there are ships and missiles that you can steer on your preferred course, using the same controls as with Attack Ship. So, there you go, a spaceship for you. Do you think there should’ve been more? Or do you think space scifi games even have to have spaceships? Share your two cents with us in the comments.